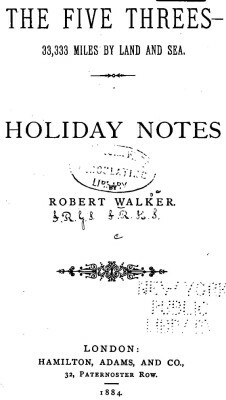 Robert Walker : Hawai'i, 1884. The Five Threes- 33,333 Miles by Land and Sea. Hamilton, Adams, and Co.,London, 1884. The bays which I have just mentioned, however, swarm with sharks, and so dangerous is it to bathe in the open waters, that a fine is imposed for the transgression of a law which has been passed in the interests of public safety. June 29th. — Took steamer to Manly Beach. This beach is much frequented by picnic parties. There are two bays on the side facing Sydney, both quiet and restful ; but by taking a quarter of a mile walk, we come upon the shell-besprinkled shores of a bay facing the blue waters of the South Pacific Ocean. Page 133 The Legend of Hinemoa. In the cool of the evening she slipped away unnoticed by the tribe and her friends, and travelled to a place named Owhata, intending to swim from this place to Mokoia. She had consequently provided herself with taha, or calabashes, as floaters. Plunging into the lake, she swam towards the island, and whenever she felt weary, rested on the calabashes. After a lengthened swim of three miles she succeeded in reaching Mokoia, but feeling cold after her long continuance in the lake, she was glad to avail herself of the warm bath on the margin of the island now called Hinemoa's Bath. The Hawaiians had many games, chiefly out-door amusements, but now they have fallen into disuse. Amongst these must be mentioned mokomoko, a method of boxing ; heenalu, surf bathing, at which the natives of Hilo, on Hawaii, and the islanders of Kauai excelled. At the time of the great tidal wave of 1 868, a native house was washed away seaward ; inside of it was a man, but he being very powerful, forced his way out, and wrenching off a board, which he used as a surf-board, he succeejded in reaching the shore with the return wave, sailing on the top of a wave fifty feet high! Page 179 Native Love of Flowers. Other games were holua, sliding down hills on a board. Konane, draughts played with white and dark-coloured stones. Ulu-maika, a game similar to our bowls. Pahu, throwing darts along the ground at a mark. Also throwing a spear or iki, in which they were very proficient. Hakookoo, wrestling. Loulou, trial of strength by finger holding. Lele-kowali, swinging with a rope made of some strong creeper, a cross bit being made at the bottom, on which they sat. Geoff Cater (2012) : Robert Walker : Hawai'i, 1884.